You can get a list of other experiments at the end of this post. Before you try this experiment, we recommend you to try experiment no. 1. In the experiment no.1, you will see how you can control the CD4094 and its corresponding LEDs without using Android phone. In this experiment, you will see how we can convert a decimal number to its binary form using an Android serial emulator and Amarino shield. On the Amarino shield, you can see that there are 8 pcs of 3mm LEDs which represent the 8 bits. In your experiment, for example, when you press 255?, you will see that all the LEDs are switched on representing 11111111 that results in actual decimal to binary conversion. Likewise, when you press 1?, you will see LEDs switched on in this pattern: 00000001, i.e. one LED is switched on and other are switched off. Step 1: Download the BLUETERM application or any other general Bluetooth serial emulator for your Android smart phone. 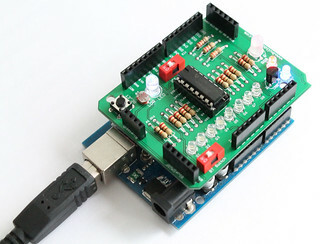 Step 2: DOWNLOAD ARDUINO SOURCE CODE and upload on to your Arduino. 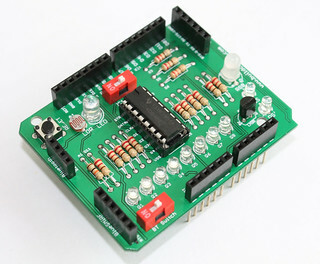 Step 3: Stack the Amarino shield over your Arduino and connect a Bluetooth Adapter. Please note that the Amarino shield supports 3 different types of Bluetooth Adapters, you can use any one of them. Check out the adapters supported by the shield. 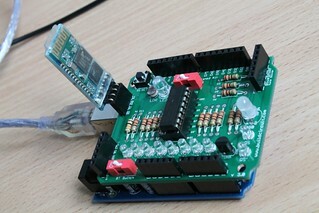 For this experiment, we are using General Bluetooth adapter, the cheapest and the best one. The cheapest Bluetooth adapter is available at www.buildcircuit.net. BUY NOW. Step 4: Connect your phone to Bluetooth adapter using Android Serial Emulator. If you are using the general Bluetooth adapter, the pairing code is 1234. For other adapters also, the pairing code should be 1234. Step 5: Switch ON the IC1 -1 P DIP switch. If the switch is off, the 10pcs of LEDs connected to CD4094 will not work. Step 6: Press a number from 0 to 255, and press ? , you will see LEDs responding as binary form of that number.